= Alasmidonta marginata Say, 1818. — Bolotov et al. (2018). = Alasmidonta marginata Say, 1818. — Lopes-Lima et al. (2017). = Alasmidonta marginata Say, 1818. — Bolotov et al. (2017). = Alasmidonta marginata Say, 1818. — IUCN (2017). 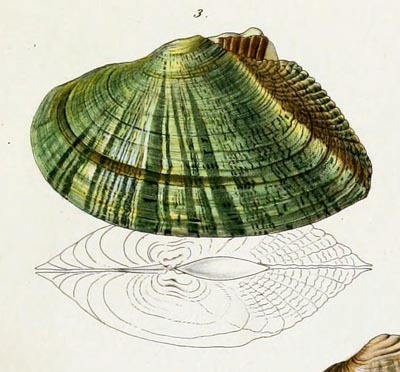 = Alasmidonta marginata Say, 1818. — Williams et al. (2017). = Alasmidonta marginata. — Jones (2015). = Alasmidonta marginata. — Kongim et al. (2015). 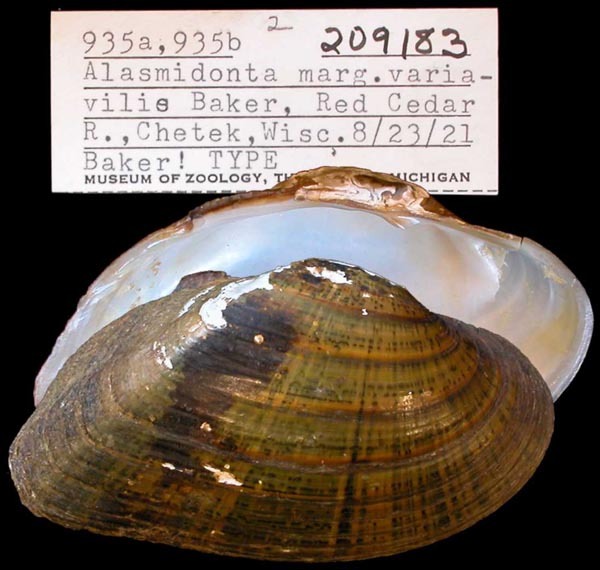 = Alasmidonta marginata. — Sousa et al. (2014). = Alasmidonta marginata. — Inoue et al. (2014). Rafinesque, 1831, Continuation: 5 [nomen nudum]. ‘Say, in lit.’ Of Authors. Lea, 1836, Synopsis Fam. Naiades: 44. Lea, 1838, Synopsis Fam. Naiades: 135. Conrad, 1853, Proc. Acad. Nat. Sci. : 262. ‘Wood’ Lea, 1836, Synopsis Fam. Naiades: 44. ‘Wood’ Lea, 1852, Synopsis Fam. Naiades: 42. ‘Wood’ Lea, 1870, Synopsis Fam. Naiades: 67. Margaritana marginata var. truncata B.H. Wright, 1898. B.H. Wright, 1898, Nautilus: 124. 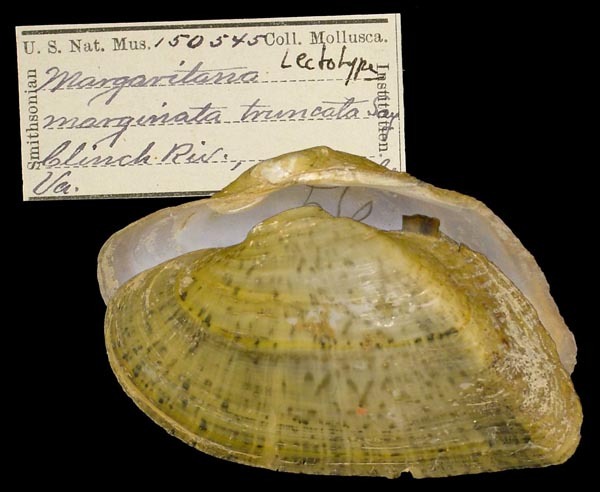 Type(s): LECTOTYPE USNM_150545, Clinch R., Va.
Alasmidonta (Decurambis) marginata susquehannae Ortmann, 1919. Ortmann, 1919, Mem. Carnegie Mus. : 187, pl. 12, fig. 4. 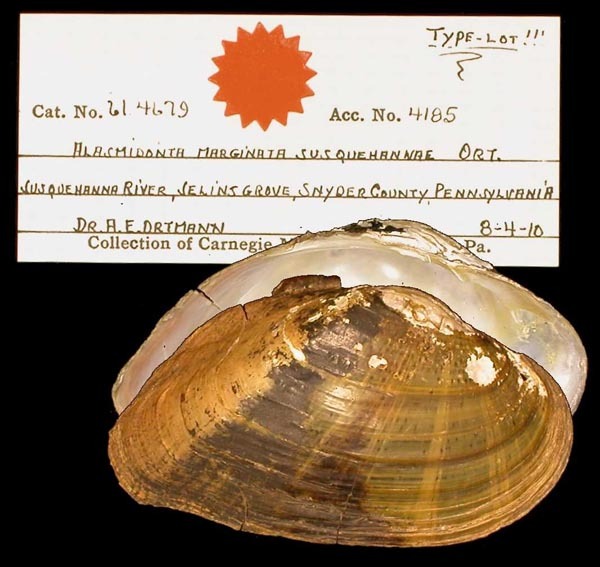 Type(s): LECTOTYPE CM_61.4679 (selected by Parodiz, 1967), Susquehanna River, Selins Grove, Snyder County, Pennsylvania.